While much of what information exists about Alzheimer’s tends to focus on only one aspect of the disease from either a scientific or personal perspective, Not Going Gently melds the two in an all-inclusive portrait of the disease. The book respectfully and honestly addresses this devastating illness that affects millions of people and their loved ones, while also offering hope through groundbreaking prevention plans. 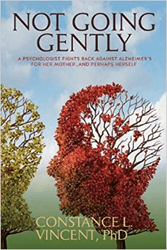 Not Going Gently was selected to be featured by Kirkus Reviews in their June 15th 2015 issue. Kirkus is considered by many to be the “world’s toughest book critic… uniquely associated with excellence,” and only 10% of Indie reviews are chosen for this honor. Not Going Gently is available at bookstores everywhere and on Amazon.com. Find out more about Dr. Vincent and her research at http://www.DrCLVincent.com. Constance is a psychologist and former university professor who studies the individual’s innate capacity to realize his or her full potential – mental, physical, emotional, and spiritual. Inspired by the quotation attributed to Socrates, “An unexamined life may not be worth living,” she is also aware of the warning from Dr. Schweitzer and others that “an unlived life” may not be worth examining. Seeking to both live fully and examine deeply, Constance’s widely varied interests, circumstances, and experiences reflect her philosophy. She lives in Northern California.